Viruses get a bad rap—and rightly so. The ability of a virus to quickly and precisely replicate itself makes it a destructive scourge to animals and plants alike. Now an interdisciplinary team of researchers in the A. James Clark School of Engineering and the College of Agriculture and Natural Resources at the University of Maryland—including Fischell Department of Bioengineering (BioE) affiliate professors Reza Ghodssi and James Culver—is turning the tables, harnessing and exploiting the "self-renewing" and "self-assembling" properties of viruses for a higher purpose: to build a new generation of small, powerful and highly efficient batteries and fuel cells. The rigid, rod-shaped Tobacco mosaic virus (TMV), which under an electron microscope looks like uncooked spaghetti, is a well-known and widespread plant virus that devastates tobacco, tomatoes, peppers, and other vegetation. But in the lab, engineers have discovered that they can harness the characteristics of TMV to build tiny components for the lithium ion batteries of the future. 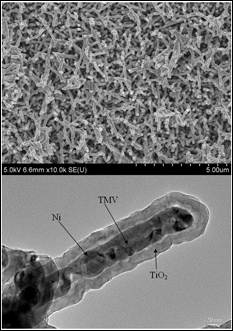 TMV's nanostructure is the ideal size and shape to use as a template for building battery electrodes. Its self-replicating and self-assembling biological properties produce structures that are both intricate and orderly. The Maryland research team has found that they can modify the TMV rods to bind perpendicularly to the metallic surface of a battery electrode and arrange them in specific patterns. The rods are then coated with a conductive thin film that acts as a current collector, and then another layer of material that participates in the battery's electrochemical reactions. The tiny, dense forest of coated rods creates an 80-fold increase in the electrode's surface area and up to a 10-fold increase in its energy storage capacity over standard lithium ion batteries, enabling fast charge/discharge times and a longer life. Because the TMV can be programmed to bind directly to metal, no other binding agents are required, making the electrodes lighter, stronger and less expensive than conventional parts. There is no risk of them transmitting the TMV virus, which is rendered inert by the manufacturing process. Video by and courtesy of Konstantinos Gerasopoulos. "The resulting batteries are a leap forward and will be ideal for use not only in consumer electronic devices, but also in other technologies that have been limited so far by the size of their power source," says Ghodssi, director of the Institute for Systems Research and Herbert Rabin Professor of Electrical and Computer Engineering at the Clark School. "For example, we can produce millimeter- or sub-millimeter-sized energy storage devices for use in large networks of tiny, wireless sensors that can be deployed to monitor security, agriculture, or the environment in remote locations." Three distinct steps are involved in the team's patent-pending process to produce a TMV-based battery: modifying, propagating and preparing the TMV; processing the TMV to grow nanorods on a metal plate; and incorporating the nanorod-coated plates into finished batteries. The interdisciplinary team of Maryland scientists and their students is what makes each step possible. Department of Plant Science and Landscape Architecture professor James Culver and research associate Adam brown, members of the Institute for Bioscience and Biotechnology, had already developed genetic modifications to the TMV that enable it to be chemically coated with conductive metals. For this project they extract enough of the customized virus from just a few tobacco plants grown in his lab to synthesize hundreds of battery electrodes. The extracted TMV is then ready for the next step of battery construction. Next, Ghodssi and his Ph.D. student Konstantinos Gerasopoulos (Department of Materials Science and Engineering) use the TMV in the first two steps of a three-step process that builds nanoscale-sized battery components. First a solution of TMV is applied to a metal electrode plate. The genetic modifications program one end of the virus to attach to the plate, producing the forest of vertically aligned virus rods. Next the rods are chemically coated with a conductive metal, mainly nickel. In the third step, the plates containing the nanostructures are delivered to Department of Chemical and Biomolecular Engineering professor Chunsheng Wang and his Ph.D. student Xilin Chen, who electrochemically deposit nanocomposites of silicon and titanium dioxide onto the metal-encased TMV. The result is a new and unique electrode architecture in which each nanorod contains a conductive metal core and an active material shell. This architecture both stabilizes the fragile silicon coating and provides it with a direct connection to the battery electrode. Finally, Chen and Gerasopoulos assemble the finished electrodes into experimental high-capacity lithium-ion batteries. "Our method is unique in that it involves direct fabrication of the electrode onto the current collector," Wang explains. "This makes the battery's power higher, and its cycle life longer." The use of the TMV virus in fabricating batteries can be scaled up to meet industrial production needs. "The process is simple, inexpensive, and renewable," Culver adds. "On average, one acre of tobacco can produce approximately 2,100 pounds of leaf tissue, yielding approximately one pound of TMV per pound of infected leaves." While the team's focus has been on batteries and energy storage, Ghodssi points out that the versatility of the TMV template will allow it to be used in the development of a variety of new technologies. "One of our ongoing projects is using TMV in the development of sensors for detecting explosives, including TNT," he says. "We're also collaborating with our colleagues at Drexel and MIT to construct TMV-based surfaces that can be used in the development of novel water-repellent surfaces and micro- and nanoscale heat pipes." Funding for the research comes from the National Science Foundation, the Department of Energy Office of Basic Energy Sciences, the Maryland Technology Development Corporation, and the Laboratory for Physical Sciences at the University of Maryland. Culver's work is conducted in collaboration with Purdue University professor Michael Harris.